Can you get a classroom carpet with numbers? There are lots of choices when it comes to choosing math rugs. While you can have an option in which the design is made entirely of numbers, there are also many designs which include letters, other languages and even games. Number rugs can be a great educational tool to reinforce classroom lessons and engage students during free play or activity time. With colorful and engaging graphics, learning can become a fun, hands-on experience. 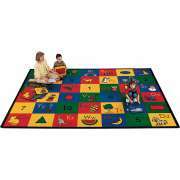 Classroom rugs really add to the ambiance of your learning space and invite students into a fun educational atmosphere. What classroom rug designs have numbers? 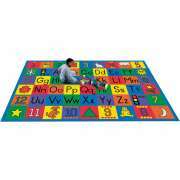 Hertz Furniture has many number rugs which include other educational material as well. 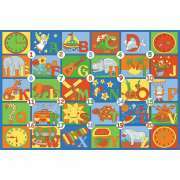 Designs which incorporate numbers and letters can be used during formal instruction and free play. 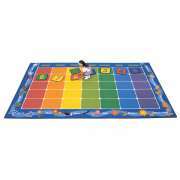 Teachers can facilitate all sorts of games and activities based on the rugs such as asking students to look for a certain letter or do a particular activity based on which number or letter they are standing on. If you have a bilingual classroom, you should definitely consider numbers rugs which include both languages. By having the names of the numbers written out, students can practice reading and counting at the same time. You can choose from bilingual rugs with English and Spanish or English and French. Do you have carpet squares for classrooms with numbers? 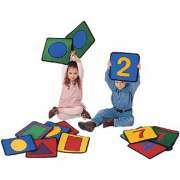 Carpet squares for classrooms can be a great educational tool when teaching lessons about numbers. We have sets which are designed like a calendar so students can learn about weeks, months and dates. 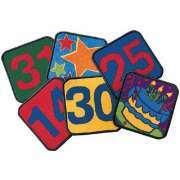 These can also be used to teach counting and number identification. Students can be asked to find squares with certain numbers or put them in the correct order. We also have classroom carpet squares that are bilingual, which can be used to reinforce a second language or to help students in any language learning classroom. What games can you do with math rugs? Besides the activities you can do on any math rugs, there are some designs that are especially conducive to games. Hopscotch rugs incorporate both math skills and a fun activity. They offer a great way to practice counting through hands-on learning. Hopscotch can be a great active indoor game, whether it’s just for a short break or a way to keep kids moving at recess on a rainy day.